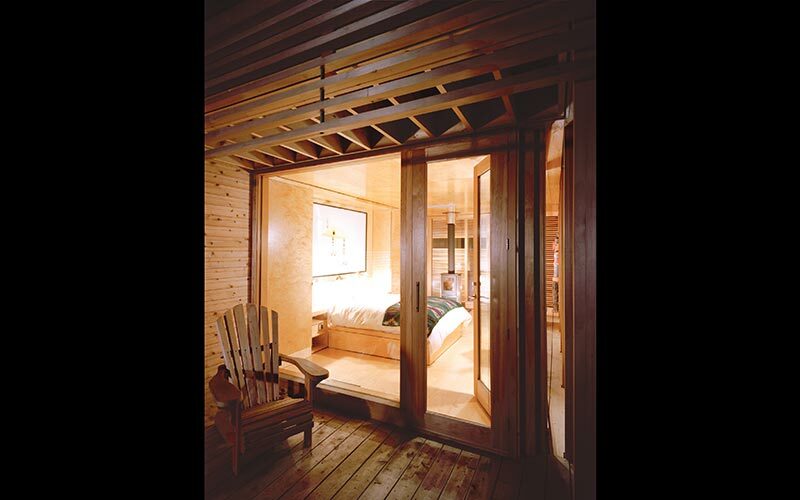 Nestled into a slope on the southern shore of Lake Simcoe, this one room sleeping cabin is a simple but sophisticated Canadian bunkie, evoking a “primitive hut” of branches constructed in the wilderness. The clients desired a private retreat from the main cottage further up the hill that would also enhance their enjoyment of the surrounding landscape in a location previously used to watch the sunset. 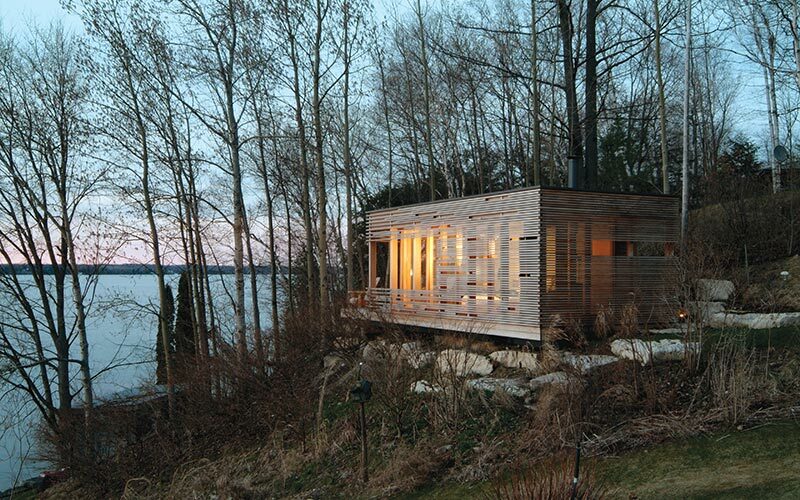 The fully insulated glass cabin is encased on three sides by cedar slats. 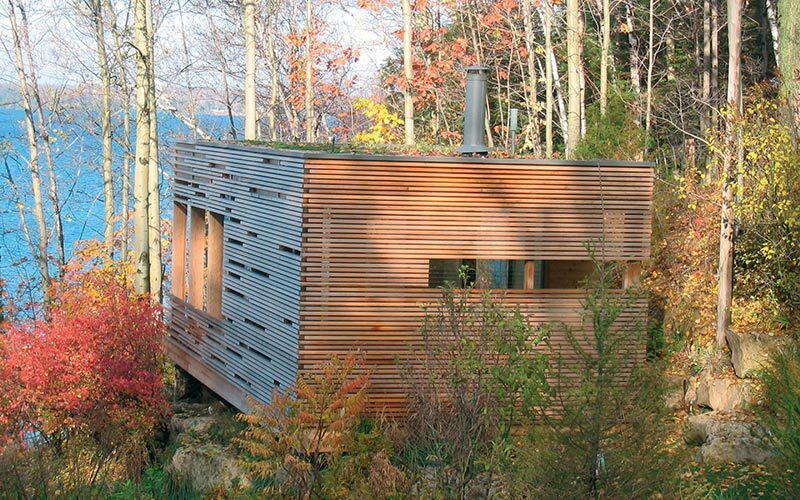 A green roof is planted with sedums and herbs to camouflage views of the cabin from the main cottage. The minimal furnishing includes a bed with built-in drawers, a wall of storage cabinets and a wood-burning stove. 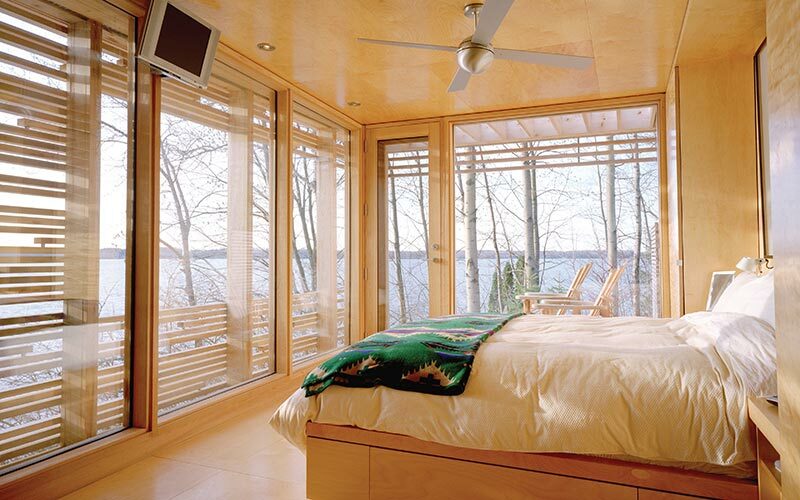 All interior surfaces, including floor and ceiling, are fabricated of birch veneer plywood. 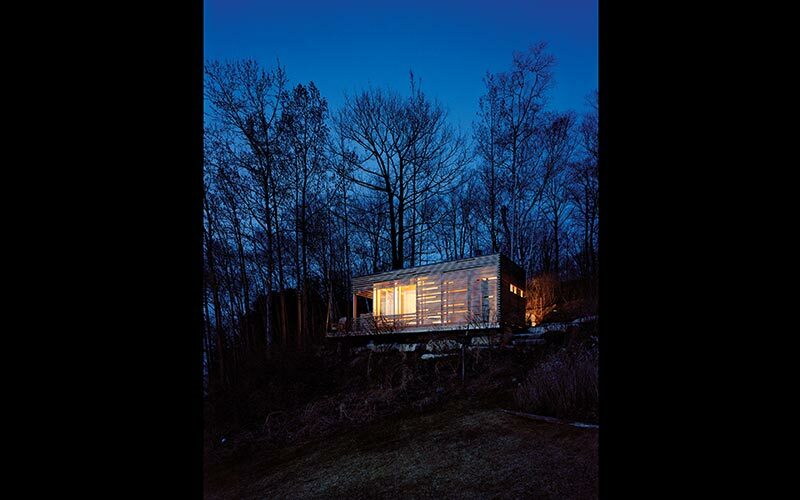 The changes of both season and time of day continuously transform the cabin’s presence and dynamics with the landscape. With trees in full leaf, it recedes into the vegetation, integrating architecture with landscape. In winter with ground and lake unified under a blanket of white, the horizontal lines of the slats are distinguished against the vertical rhythm of bare tree trunks. By day, the interior experience is a play between light and shadow as sunlight filters through the screen, projecting ever-changing patterns onto the floor. The random gaps provide abstract snapshots of vegetation, lake and sky. 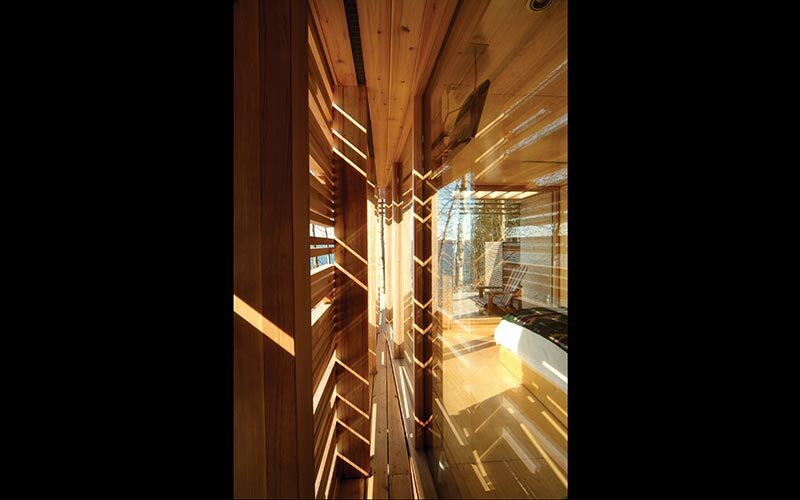 After dusk the effect is reversed — cloaked in darkness, the cabin evokes a lantern-like quality, radiating golden electric light from between the slats. To simplify the complications of working at a remote, sloping site, the project was prefabricated in a parking lot in Toronto over a period of four weeks. Components were numbered, disassembled and reconstructed on site in just ten days. Prefabrication reduced costs by decreasing construction time and labour costs during installation and brought minimum disruption to the landscape.